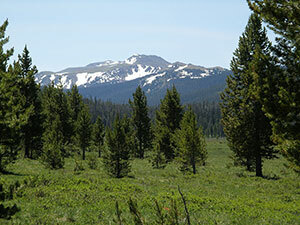 The United States Congress designated the Rawah Wilderness (map) in 1964 and it now has a total of 74,408 acres. All of this wilderness is located in Colorado and is managed by the Forest Service. The Rawah Wilderness is bordered by the Neota Wilderness to the southeast. Just before the Front Range of the Colorado Rockies fades into Wyoming's Medicine Bow Mountains, the Rawah Wilderness protects a scenic high country of U-shaped glacier-carved valleys and peaks reaching 12,951 feet. To the south and west of the area lies an almost roadless Colorado State Forest, an unofficial extension of the Wilderness. Melting snow fills 26 lakes within the area. On the upper forested slopes of the mountains, especially in the southern section, clusters of old-growth spruce and fir abound. You can expend energy on more than 75 miles of trails. Take the Link Trail in the north for nine miles to join the Rawah Trail. Take the Rawah Trail across Grassy Pass and continue on down to the West Branch Trail. Take the West Branch Trail up, then turn south on the Blue Lake Trail and continue to the trailhead. You will have accomplished a cross-Wilderness hike of 24 miles that presents a taste of everything this area has to offer. Fall attracts many deer and elk hunters. Bighorn sheep are occasionally spotted, and moose that were reintroduced in the 1970s are now doing well. Planning to Visit the Rawah Wilderness? How to follow the seven standard Leave No Trace principles differs in different parts of the country (desert vs. Rocky Mountains). Click on any of the principles listed below to learn more about how they apply in the Rawah Wilderness.